Jester was invited to Dr. McDougal’s Thanksgiving leftovers party last night and discussed the recent findings. The following interview has been edited and condensed. Jester: Dr. McDougal, thank you so much for having me to your home. Elizabeth McDougal: Oh, please. Call me Liz. J: Okay, Liz. Tell me about this so-called “miracle method” for quitting smoking. E.M.: Our team was able to use leftover Thanksgiving food, the stuff that has been sitting in the fridge for three or more days, to actually condition people into having a taste aversion for cigarettes. Basically what you do, if you want to help a loved one quit smoking, is you roast a turkey as you would for Thanksgiving dinner. You and the loved one then partake in the turkey dinner and refrigerate the leftovers. Over the course of the next week, you feed them cold turkey every time they smoke. J: Interesting. So by the time all the cold turkey is consumed, this loved one would associate the taste of Thanksgiving past with the taste of cigarette smoke. E.M.: Exactly. From now on, when someone says, “I’m going cold turkey” in reference to quitting smoking, this method is what they’re referring to. J: Wow. You really think that you can change the vernacular of a whole society? E.M.: Oh, absolutely. We’ve coined another term folks can use for quitting something without any kind of phase-out. 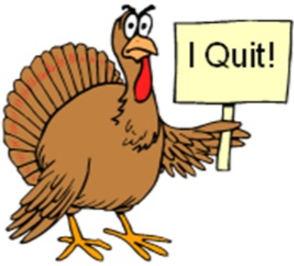 E.M.: Our team was really inspired by the Thanksgiving holiday and especially its aftermath. Family members you tolerated when wine and pie were plentiful on the Thursday of carbs and bliss, by day three of Thanksgiving weekend have started to grate on your nerves like serrated metal on sharp cheddar. And as if that isn’t enough, all you have to eat is cold turkey. J: You must have a trying family dynamic. E.M.: Doesn’t everyone? With circumstances like this, it can be easy to turn to negative coping skills, such as smoking. But my team and I thought, hey. What if we could turn cold turkey into a positive? What if we could use this horrid leftover for good? J: And that’s exactly what you did. E.M.: Yes! That’s exactly what we did. My eBook, The Cold Turkey Method, comes out on Amazon in mid-December.